For sale in U.S. and Canada only -- Swords fly as Beowulf battles the evil Grendel in this exciting animated adaptation of the epic poem. Incorporating fascinating sketch art and featuring the voice of Joseph Fiennes as Beowulf. Part of the multivolume World Literary Classics DVD Series. A Teacher's Guide is included and available online. Gr 9 Up - This animated adaptation of the Old English epic poem will have great appeal for teens who are studying the work as well as those who enjoy adventure and fantasy. Remaining true to the classic story, this quality video is narrated in modern English by Sir Derek Jacobi. Joseph Fiennes provides the voice of the brave warrior, Beowulf, who travels to the banquet hall of King Hrothgar, where festivities have been disrupted and warriors slaughtered by the monster Grendel. Beowulf proves to be a hero by slaying Grendel after a mighty hand-to-hand battle in which he wrenches the monster's arm off and displays it as a trophy. 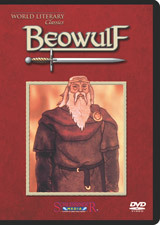 Next on Beowulf's itinerary of heroic deeds is a confrontation with Grendel's mother, who he finds deep in her watery lair and defeats with a magic sword. Beowulf returns to his homeland to rule for the remainder of his life, but dies fighting in his final challenge from a fire-breathing dragon. The animation here is colorful, dramatic, and sometimes surreal. The monsters, which are often portrayed as looming shadowy figures, allow viewers' imaginations to go wild. This concise, exciting production will introduce this classic piece of literature to teens and supplement the curriculum. Copyright 2000 School Library Journal. Used with permission.